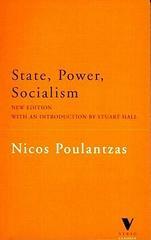 I've recently been reading Nicos Poulantzas's, State, Power, Socialism. Partly because the bright orange of the Verso Classics edition has glowered at me from the shelf for the best part of a decade, partly because I want something a little bit heavyweight to blog about (previous extended postings Lukacs, JS Mill, and Gramsci were well-received), partly as an exercise in self-clarification, and lastly because Poulantzas's work deserves wider circulation among present day socialists. My thinking and political priorities have undergone something of a change since this blog started almost a decade ago. Then I was an unorthodox Marxist and self-regarding revolutionary socialist hanging around in an equally self-regarding orthodox Marxist outfit. And now? Good question. I still think capitalism needs superceding, that Marx provided the method and most of the basic concepts to understand it, and that the collective action of working people organised as the labour movement have something to do with transforming what we've got into something better. Beyond that, I know the revolutionary road to socialism is a non-starter. The greatest contribution the far left in the advanced countries have furnished socialist thought is to underline that argument by their spirited and persistent irrelevance. And yet the polemics of Rosa Luxemburg against the parliamentary road to socialism retain their force as history has confirmed and reconfirmed her position time and again. It has seemed to me that a third way might be possible, but one premised on the difficult task of building up the labour movement in an era where its base is under pressure and somehow managing and transforming the state to strengthen our collective strength seemed about the best bet. This wasn't to be a long march through the institutions, but rather using our political clout to strengthen our political hand. It is about building up a constituency whose interests go beyond dull conformity and hidden exploitation, and in so doing change the system as that collective itself changes. An impossible task perhaps, but one that could lead to very real material benefits for our people where and when such a project meets success. This kind of project was pursued by the Eurocommunist tendencies in several continental communist and socialist parties in the 70s and 80s, without much in the way of success. Nicos Poulantzas, before his life was cut cruelly short by mental health problems, was influential in rethinking the Marxist approach to the state and couching Eurocommunism in Marxist terms. Having made his name during the 70s as a disciple of Louis Althusser via a series of innovative analyses of the state (including a bad tempered exchange in New Left Review with Ralph Miliband), State, Power, Socialism is a culmination of his thought and also, sadly, his epitaph. Nevertheless, what Poulantzas tried to do was recast the Marxist approach to the state as something struggled over by competing groups of capital, as a manager of the interests of capital-in-general, and as a phenomenon constituted by the relations of production and therefore an object and site of class struggle. The resulting argument is full of insight and foresight, of relationships still yet to be fully analysed and explored, and of the problems and opportunities this more "open" view of the capitalist state presents the labour movement. Striking something of a gloomy note, Poulantzas recognised that a constant and persistent effort of building up one's forces, capturing and transforming the state, while checking the tendencies eroding the solidarity socialism depended on was a big ask, and one far from the conceited guarantees of the revolutionary road. Poulantazas however was to suffer a double indignity. Those who you would think might be interested in a serious intervention around the problems of socialist strategy in the advanced countries - the far left - remained largely wedded to the road map scribbled down by old Trotters. And beyond a small group interested in sociological issues around the role of the state in society, academic radicalism went voguing with post-structuralism down any blind alley it could find. The question of linking the micro-levels power operates at with wider scale processes, such as the operation of class and capitalism, were filed under 'do not bother'. With a new spirit of radicalism in the air and a generation of activists looking afresh at what Marxism and radical social theory has to say about power, capital, and the state, a rereading of Poulantzas is timely and, I hope for those who follow this series, proves useful. Just a note on reading State, Power, Socialism itself. Considering Poulantzas came from the Althusserian school, whose Marxism was noted for excessive technical verbiage and tortured writing, Poulantzas is as clear as the complex object of his study allows him to be. If you are familiar with basic Marxist concepts and terminology, anyone giving the book a stab shouldn't find it difficult provided one is willing to think along with it. The second relates to a point made by Mike: that Poulantzas lacked a theory of money, and therefore an appreciation of how deeply that state was constituted and traversed by class relationships. This meant, by implication, the Poulantzas offered a more radicalised version of the traditional social democratic view of the state as an institution independent of and existing above class relationships. I don't think this is the case, but I can understand why it's made. Much of the confusion around seemingly contradictory statements made by Marx in Capital can be put down to the use of abstraction as an analytical tool. As Marx planned but never wrote additional volumes of Capital on the political economy of the working class, the global economy, and the state, I take State, Power, Socialism as a contribution to filling the gap left by the absence of the last volume. As such, to tease out some of the relationships that require understanding and verifying on the basis of further research, abstracting from matters of political economy beyond general comments to bring out the specificity of the capitalist state-in-general for analytical purposes is a tried and tested method. The format will be very similar to the previous extended discussions, looking in-depth at arguments, utilising contemporary political examples to highlight the points made, and evaluating them in light of subsequent debates and developments. As they appear the posts will be listed below.